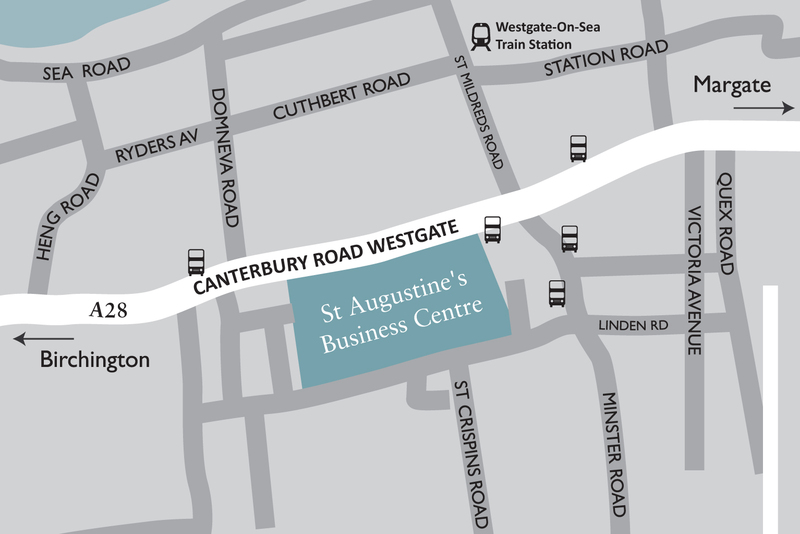 St. Augustine's Business Centre is located within a beautiful Grade II listed building, which benefits from excellent transport links and dedicated on-site parking to provide a highly professional and impressive image for your company. Within this attractive historical setting, tenants can enjoy state- of-the-art serviced offices and on-site conference facilities with multiple workstations giving you flexibility on office layout. Westgate train station is just a four-minute walk away, whilst bus stops are located on the main road (A28) providing easy commuting from Canterbury (A28), Dover and Deal (A256). 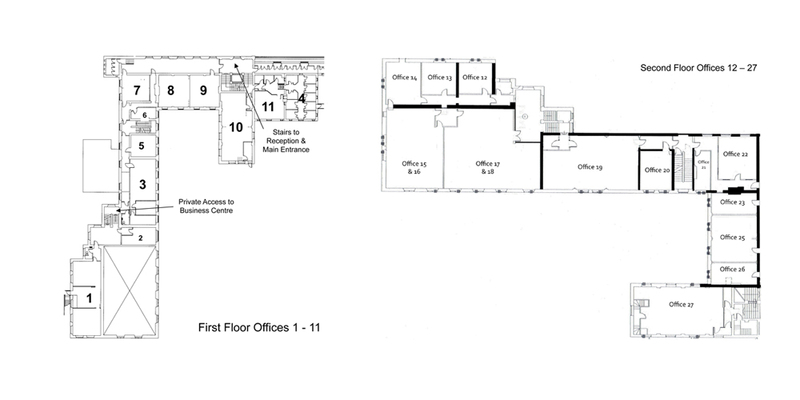 Our 27 offices are conveniently located over the 1st, 2nd and 3rd floors, the majority of which enjoy views over our central courtyard and gardens. Each floor has informal breakout areas and kitchenettes, where employees can socialise during coffee and lunch breaks. Externally, a patio area provides the opportunity for fresh air or an alfresco lunch. Our attentive staff will ensure a relaxed and friendly environment, and all of our offices are fully equipped with all the technology you will need, making St Augustine's the smart choice for your business. All offices are available on a monthly licence or long-term leases - please call us for more information on availability on 01843 830150. Our managed digital telephone system can be programmed with up to five direct-dial numbers for the same cost as one line through British Telecom. Facilities include voicemail, call forwarding and per second billing, offering up to a 10% saving on British Telecom business call rates. Our high-speed broadband is supplied via Ethernet First Mile cabling for excellent usage speeds. Fair use broadband is available to each office's private I.P address and its capacity can be increased to meet your needs. Receive notification of post delivery and we will take stamped envelopes for mailing. Available by the hour, our secretarial services include copy typing and dictation, photocopying and faxing. We also offer an additional service assisting with mail shot co-ordination (envelope filling and labelling). We provide a daily or weekly individual office cleaning service at the same price as local cleaners, assuring security of the building and confidentiality for your business. For those who need to hold meetings or business conferences on-site, St Augustine’s has the unique benefit of having conference and meeting room facilities within the same building. We are pleased to offer exclusive discounted rates on room hire to our tenants and with a wide variety of room sizes this is the perfect proposition for any meeting or event. Small rooms are available by the hour or on a half-day basis and larger boardrooms are available on a half-day or full-day basis. Our simple contract starts for a minimum of three months, thereafter on a monthly basis, which means that you avoid expensive legal fees as you have complete flexibility over your contract. Many of our tenants have found this extremely beneficial as they have been able to move to a larger office within the building without lengthy notice periods. The rate includes all utilities. There are 3 levels: Bronze, Silver and Gold, so you can choose which level of service is right for you. You also have the option of additional facilities such as the use of meeting rooms (charged per hour), or hot-desking (charged per hour, or on a half-day or full-day basis). Call us now for further information and our latest offers. The Office Pod is an upgrade to hot-desking – like having your own permanent mini private office. We have seven individual secure and sound-proof booths, all with natural daylight. We supply the Pod complete with broadband, direct-dial telephone, work station and chair. All you need to do is plug in your laptop and you are away – that's the beauty of the Office Pod. With low commitment and low cost, it is ideal if you can't afford a permanent office, if you find working from home too distracting, if you are looking to downsize or relocate, if you are a salesman on the road, or if you are starting up a new business. The Pods are available on a monthly basis and are priced at £140 per month.